Spellbinders Floral Doily Accents and Motifs. There are many sets to choose from and this Spellbinders Floral Doily Accents and Motifs is just one of them. But if you take the time to play you can get many different looks from one set. 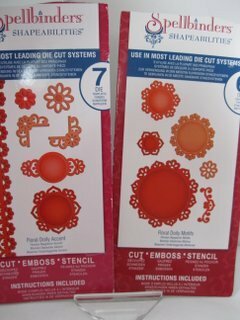 Spellbinders are the brand name of steel dies that will create shapes in card and they are something that many people have now started to collect ... me included ! But once you start they can become very addictive. The patterns and shapes are becoming more and more delicate and intricate. This is what the set looks like and once you get yours home you can play. One of the first things I always do is cut out the shapes in a cheaper card. Then layer them up in different ways, seeing what will fit where. That is the way to see how you can get more and more from each set. The video will show you some ideas that you may like to try for yourself and you can use these ideas with any sets that you buy. Don't be afraid to cut them up and use them other than the way they are intended. For instance cut two of the tags in different colours. Add your sentiment to one and cut the other up and use it as a frame around the sentiment tag. Both of these cards look totally different just by using each of the shapes in another way. 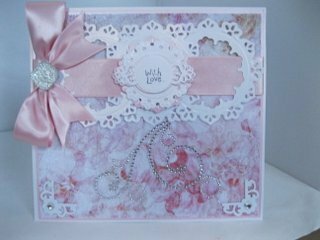 Altering the colour and the embellishments can all help to produce a card that is very pretty. This pink card has the addition of Micro Glass Beads to the backgound. It is only my personal choice ... but I always buy the Accents and Motifs together... that way I know that they will work well with each other. But any set of Spellbinders will work with any other set ... and they also play nicely with the dies from other companies too. The difference they will make to your cards and therefore your confidence will amaze you and you will be delighted with your results.